Take the New York architecture tour to learn everything about the incredible architecture of Manhattan. In about 2.5 to 3 hours the guide will tell you all about the many skyscrapers and unique buildings of New York. The tour will start near the United Nations Headquarters in East Manhattan. From there the guide will take you along several buildings in Midtown Manhattan. When the tour is finished you’ll be able to tell your friends everything about the architecture of the main landmarks in the city! From the United Nations Headquarters you’ll explore the architecture of East Manhattan. 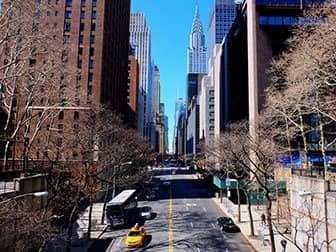 You’ll walk to Tudor City, an incredible oasis of peace and quiet in the middle of the hustle and bustle of Manhattan. From there the tour continues towards Times Square, while passing by a number of other architectural masterpieces. 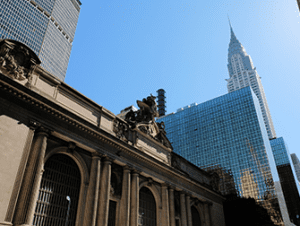 Find out what’s special about Grand Central Terminal and see the famous Chrysler Building. You’ll explore New York’s Theater District and come across sights from movies and television shows filmed throughout Midtown. You can even sneak into some of the city’s hidden gems and have a look at the interiors of several monuments throughout this tour. 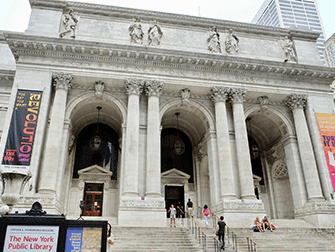 The New York architecture tour is a must for anyone who is interested in architecture, or whomever wants to learn more about the city’s history. After purchasing, you will receive a voucher that you can print out and use as your ticket for the tour, or show as a mobile ticket on your smartphone.